Field Methods in Indigenous Archaeology (FMIA) is a community-based participatory research project that involves the Confederated Tribes of Grand Ronde Community of Oregon (CTGR), the CTGR Tribal Historic Preservation Office (THPO), and the University of Washington. The CTGR THPO is responsible for a variety of tasks related to the care and management of tribal cultural resources. These resources are integral to tribal heritage and include archaeological and ancestral sites, sacred places, and traditional cultural landscapes. The overarching goal of our collaboration is to contribute to the capacity of the CTGR THPO to manage tribal heritage on the Grand Ronde reservation, which is located in western Oregon, approximately 60 miles SW Portland. 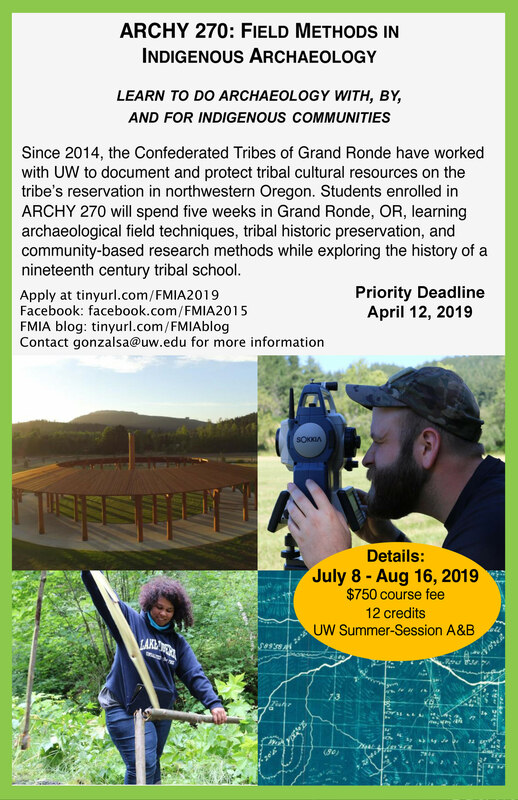 This summer, the University of Washington and the Confederated Tribes of Grand Ronde are offering a five week field course (ARCHY 270) in tribal historic preservation and archaeological field methods on the Grand Ronde Reservation in Grand Ronde, OR running from July 8 – August 16, 2019. Enrolled students will work with and alongside the Grand Ronde Historic Preservation Office to document historic reservation properties, including a nineteenth century school. ARCHY 270 is a unique opportunity to gain firsthand experience in archaeological and community-based research. Lectures, field trips, workshops, and public outreach will complement these skills and present additional opportunities for students to explore the intersections between tribal historic preservation and archaeological practice. ARCHY 270 is offered through the Department of Anthropology at the University of Washington, Seattle. Participation in the field course will earn students 12 university credits. The course fee covers all food, lodging, and transportation costs as well as occasional restaurant meals and expenses for local field trips. For more information, please contact Dr. Sara Gonzalez at: gonzalsa@uw.edu. Students enrolled in the FMIA field school contribute to a course blog. Topics include discussions of community-based and archaeological research methods, the application of indigenous methods in archaeological field practice, approaches to tribal historic preservation, and Grand Ronde tribal history. Please read and comment on their blog posts.